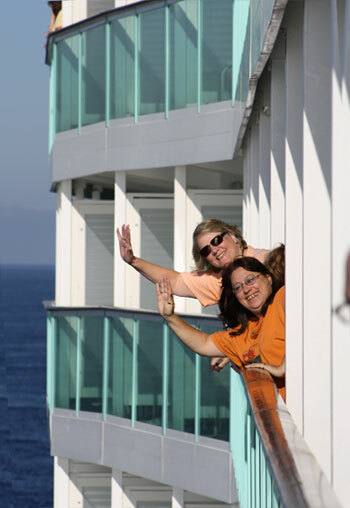 F members cruise around the world on Royal Caribbean and Celebrity cruise ships. They enjoy daily, private water exercise classes taught by AEA certified fitness instructors who invite their hometown students on fitness cruises. 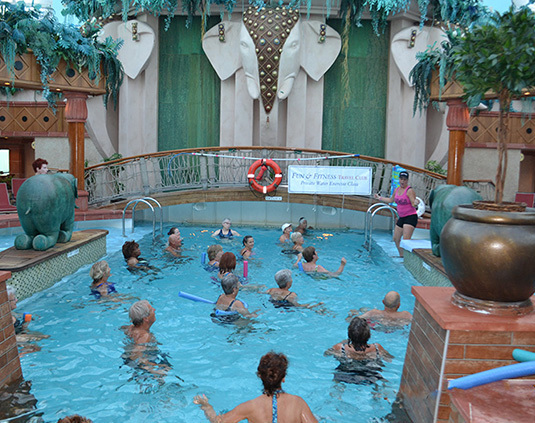 Water exercises are held on board ship in outdoor and indoor, heated, Solarium pools. 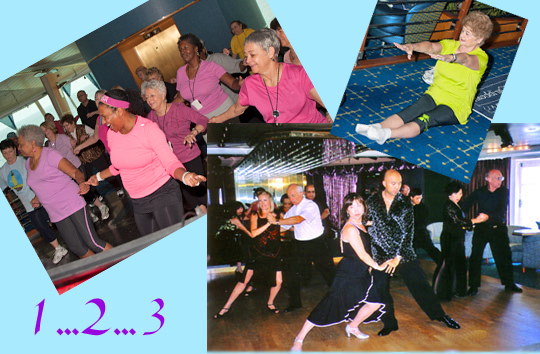 Fitness cuises can include tai chi, yoga, Zumba, deck walking, ballroom dance lessons and even English Country Dance gatherings. There are no membership fees, dues or meetings required to attend to be in this club, making it a very popular club. 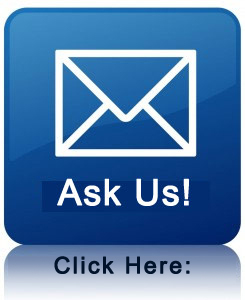 Click here for testimonial. Allow video time to load. 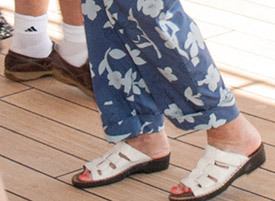 is recognized by Royal Caribbean as a top cruise producer in the mid-Atlantic states of Virginia, Maryland Delaware and Washingtgon, D.C. Cynthia Neu McCluskey is the club's Founder and Cruise Coordinator. Barb Batson is National Cruise Fitness Host Recruiter. 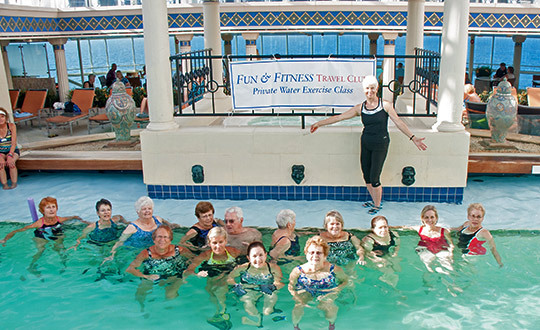 began in 1998 with 23 water aerobics students led by the club's first Cruise Fitness Host Jim Seeley. Today it has 250 certified instructors and 6000 members nationwide. Members have been cruising togther world wide for twenty years. They look forward to the next twenty. For fitness cruises click here! "Thank all of you for putting together our delightful cruise!! We were totally thrilled with each and every aspect. The ship was wonderful, the food was sensational, the ports were all ultra-interesting, and your Zumba people were all friendly and fun and so full of enthusiasm. We look forward to the next wonderful cruise you plan and will be standing in line with our hands up ready to join you! Thank you, Thank you! We will always remember this super, super trip!!" 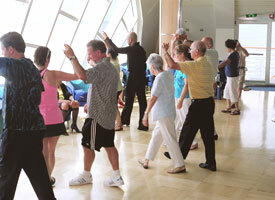 F cruises are tailored for guests who want to exercise while traveling. It's been featured by national media outlets and in the corporate publications of both Royal Caribbean and Celebrity Cruise Lines. 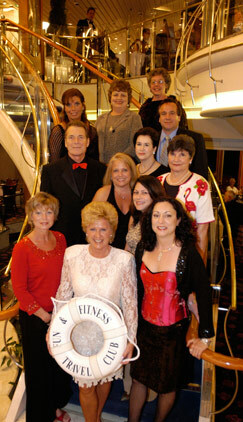 members are welcome aboard each ship because they practice good health habits and bring along a great sense of humor. They exercise in the ships' various outdoor and indoor Solarium heated pools. After enjoying daily exercise classes and shore excursions together, they dine at their own private tables in the formal dining halls on luxurious cruise liners. Thier mid-ship Staterooms are booked near elevators in up-graded categories at senior, group, discounted rates. Special dietary meals are available. 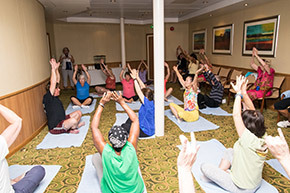 The club frequently adds yoga, Zumba, tai chi classes and more, to complement its highly rated water aerobics theme cruises. 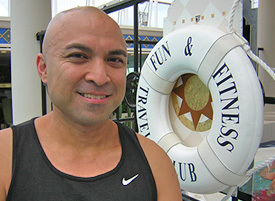 All classes are taught by certified fitness instructors from across America who travel with the club. 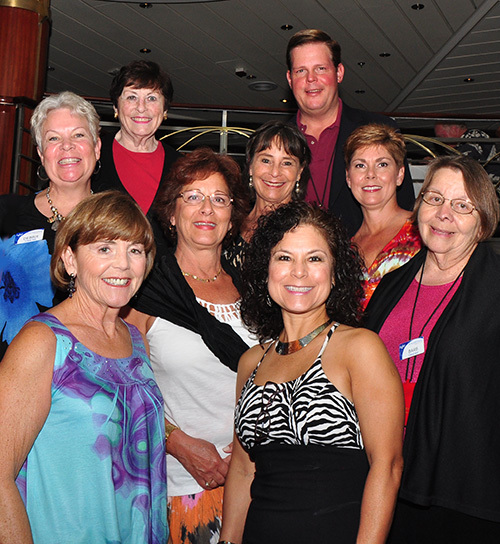 Some of the most popular cruise hosts are shown above in the photo clockwise starting from the top: Cruise Program Director Jim Seeley of Virginia, Tammy McAlister of Texas, Barb Batson of Tennessee, Mary Holder of Texas, Linda Johnson of Pennsylvania (in white), Jane Hunter of Florida, Debbie Reiss of Arizona, Jackie Votava of Oklahoma, and Kathy Potts of Illinois who stands in front of Jim. To travel with guests must be at least 30 years of age and have valid passports. A big benefit in traveling with this club is its generous policy regarding deposits and final payments. Any guest can also "lay away to cruise away." All deposits and lay away payments are 100% refundable with no insurance required if the guest cancels at least 100 days before departure. Club members say, "The easiest part about a cruise is how to pay for it!" Price includes all TIPS PAID! To see what cruise guests had to say following the club's most recent cruise to the ABC Caribbean Islands April 1-12, 2019. Click here. Cruise prices are based on double occupancy, per person, in an Inside Stateroom. Port charges are included. They do not include gov't departure taxes, customs fees or security and service surcharges. Air fare is not included. A 100% refund is guaranteed if you cancel at least 100 days before departure. 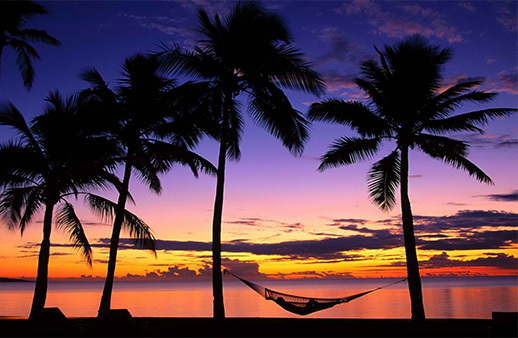 No insurance is required for this travel club refund benefit. F has more than 6000 members and 250 Fitness Hosts nationwide. 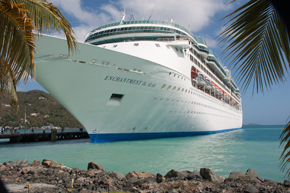 Its certified instructors have escorted their hometown guests on cruises to all the Caribbean Islands, the Mexican Riviera, Hawaii, the Inside Passage to Alaska, through the Panama Canal, to Bermuda and all along the Eastern Shores from Charleston to New York City to Quebec, Canada. They've sailed away from Seattle, New Orleans, Galveston, San Diego, Los Angeles, Vancouver, B.C. ; Philadelphia, Miami, Ft. Lauderdale, Tampa, Honolulu, as well as Barcelona, Spain; St. Petersburg, Russia; Dublin, Ireland; Amsterdam, Holland; Sydney, Australia; Wellington, New Zealand; San Juan, Puerto Rico; Buenos Aires, Argentina; Athens, Greece and Alexandria, Egypt. They've even cruised around Cape Horn going to the South Pole. A favorite sailing is to Canada each October to see the fall foliage. This club has even cruised to, Israel, Turkey and Cypress. Where would you like to go? Be sure your passport is valid. Everything is arranged. "You go beyond good customer service," says Janet Davenport, Hutto, Texas. 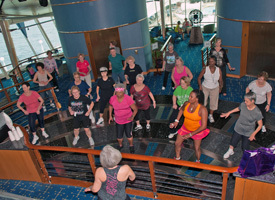 F offers various exercise classes each day on its cruises. Take one or all. 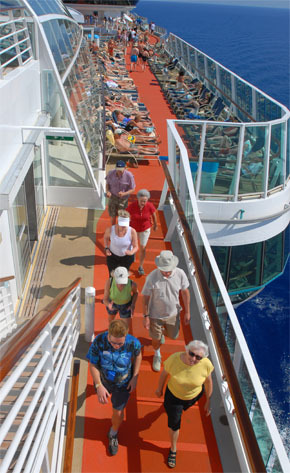 Your cruise fare includes all exercise sessions and cruise activities. There are no dues or membership fees to join this fitness theme travel club. Nor do you need to be good at sports. However, it is a lot more fun when you are yourself a Good Sport! JOB DONE! Cruise Host Elaine Nollet of Niskayuna, NY, congratulates her students when finishing their first morning water execises on board ship. Students love the heated, indoor Solarium pools on Royal Caribbean and Celebrity cruise ships. All classes are held in private. "WONDERFUL!," is how Carol and Sam Backman of Springfield, VA describe their recent cruise. They're shown here at the Street Fair in Charleston, SC, one of Royal Caribbean's favorite ports of call. Carol and Sam are popular long time members of the club. In fact, Sam is the main phographer of the . "Let me speak to the Captain." Host Cindy Gober (center in white) and her fitness followers are from Elizabethton, TN.
" is is the perfect name," say Tina Larkin and Linda Lipscomb, both of Tucson, AZ. "Thank you for a great cruise! All the water aerobics teachers were wonderful. When you offer another cruise at our 'Y' we'll be first to sign up!" 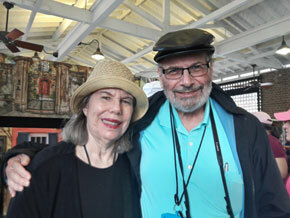 Judith and Ed Zdinak, Staunton, VA.
"I loved our cruise! 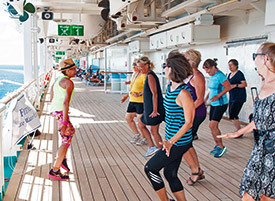 Thank you for making this great idea to exercise while you cruise come to life. It is certainly hard to come back to cold Detroit after cruising!" Donna Edwards, Detroit, MI. "Thank you. Fun & Fitness was great! I really appreciate traveling with a group." Robin Joseph, Lawrence, KS. "Absolutely fabulous cruise! Can't miss out cruising with the Fun & Fitness Travel Club. It is what it says...Fun with Fitness!" Josephine Metress, Annandale, VA.
"Thank you for all your hard work in arranging such a wonderful cruise! I had a fantastic time. I do appreciate all your efforts and will forever have fond memories to cherish." Lynn Smith, Galveston, TX. "Thank you for all your hard work and fine organization for the cruise. We had a really great time!" Terri and Jim O'Connell, Centreville, MD. "Thank you! I was fully reimbursed by your travel insurance company before I even received a letter from my doctor confirming I was sick and could not go on the cruise. You guys are remarkable!" Jeannie Stahl, Phoenix, AZ. "My cabin mate and I had a wonderful time. We were kept informed throughout the cruise. We enjoyed new instructors with new class choices, which were all very well attended too! Thank you again for all your hard work in making this trip a tremendous success." Marian Weber, Washington, D.C.
"Thanks so much for such a great first cruise. It will not be my last." "The only way I will cruise now is with Fun & Fitness. You had so many physical activities for us to do on the ship. I'd have been too lazy and unhappy without your great fitness coaches and classes in water exercise, deck walking, tai chi and everything else! Do keep me on your list for travel. Use my name any time to say how great is your cruising concept." Barb Gough, Staunton, VA.
"This was my first cruise, and I was full of trepidation. But we had a wonderful time! I am now ready to go again. How about Alaska?! Our Cruise Hosts were everywhere and took excellent care of us. You have a fine organization." To hear Joan Houghton of Peachtree, GA click on the circle. For more information about this dues-free travel club go to "Upcoming Cruises." Port charges are included in cruise fares. Call 800-955-9942 or e-mail Cynthia@fun-fitness.com for more information. The club requests guests be at least 30 years of age to cruise. 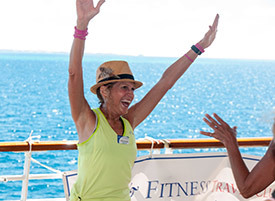 You can also call Fitness Host Coordinator Barb Batson at 800-500-8905 to learn how you might host a fitness cruise, if you are a certified fitness professional. Parent company of the is Ventures in Travel, a subsidiary of Ventures in Video, Inc., located in Falls Church, VA. It is a member of the Cruise Lines International Association (CLIA). 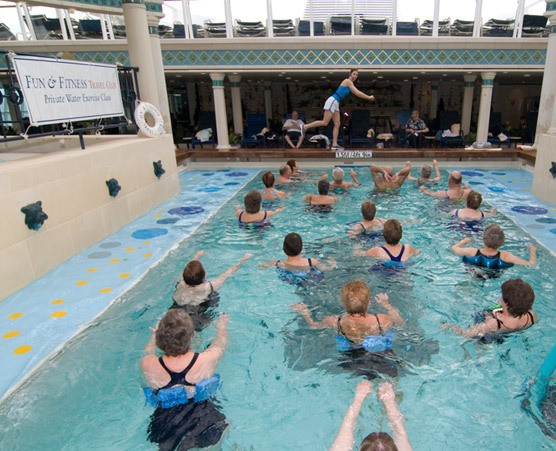 Instructors on cruises are certified by AEA (the Aquatic Exercise Association). Another fitness resource for the club is ExerciseFriends.com where exercise partners can find each other by zip codes. The was created to encourage travelers with arthritis to overcome pain when traveling by doing their daily water exercises in the indoor, heated pools of Royal Caribbean and Celebrity cruise ships just like they do at home in their communities. Cruise Program Director Jim Seeley and Cruise Coordinator Cynthia Neu McCluskey are both certified to teach water arthritis. They met at Spring Hill RECenter in 1998 in McLean, VA., where their concept for the popular was born. Cynthia and Jim continue teaching daily, morning water arthritis exercises in the pools of the Fairfax County Park Authority (FCPA) in Virginia. They do this while also managing their award winning .